MacSween of Edinburgh, a third generation family company, has been at the forefront of haggis and black pudding making for 60 years. 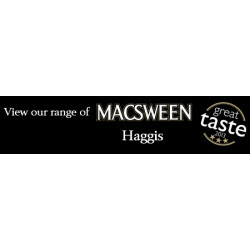 MacSween haggis is handcrafted to unique family recipes, using the finest ingredients. MacSween's believe that the foundation of their business' success is their team, and they recognise the importance of their people and our place within the local community. As pioneers of Scotland's national dish, MacSween's are passionate about taking haggis to a new place in an environmentally and ethically sustainable manner, and extolling MacSween haggis as a versatile ingredient that is perfect for all seasons, occasions and places. Please note that if you order more than one of our MacSween chieftain haggis we reserve the right to provide you the equivalent weight made up of other sizes of MacSween haggis.